NASHVILLE, TN — Tennessee State University found its own unique way to honor a fallen professor this afternoon. 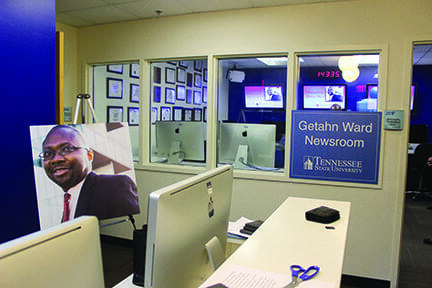 The Communications department held a tribute ceremony for Getahn Ward, a longtime staffer at the Tennessean and journalism professor at the University, who died December 16th due to an illness during winter break. Sadly, this came only a few days after final grades were due. 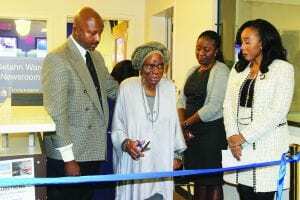 Professor Wards family holds an award commemorating Wards contributions in the community and to TSU, given to them by TSU’s Communications Department. A small committee within the department was assembled to both find a way to honor Ward’s memory, and also involve his family before they had to board a plane and return to Liberia. So they held the assembly today, the culmination for his surviving family members of a month of mourning his loss. “Special thanks to Gannet publishing, The Tennessean, The Nashville chapter of National Association of Black Journalists, and all others that contributed to the Gethan Ward Endowed Scholarship fund,” Dr. Tameka Winston, Interim Chair of the Communications department, said. 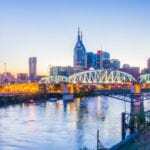 As part of the Nashville community’s response to his death, a scholarship fund was named after Ward, created specifically for Tennessee State University Journalism students. The initial scholarship amount was announced at fifty one thousand dollars, with funds still being accepted. Mistress of Ceremonies, Interim director of the college of communication, Dr. Tameka Winston. Dr. Winston also gave the family a glass award from the department, dedicated to Ward’s contributions. The University in turn gave the department permission to name the news room after Ward, who was both a hugely popular professor and acclaimed professional, as well as an honored alumnus. “Some of the few lessons we can take away from his wonderful legacy is to be consistent. When you give your word keep your word, be humble, you don’t have to be seen to be present, be amazing, you have greatness within you that you need to realize,” Dr. Sybril Brown, fellow NABJ member, said as she gave her tribute to him. 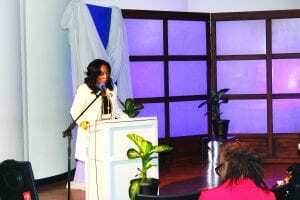 Dr. Tameka Winston look on. 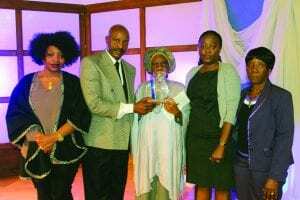 In addition, the companies where he worked honored his contributions with vigils, tribute dinners, and published testimonials during the month of December. These kept the family busy. Ward’s mother reminisced about sitting in the library, waiting for her son to get out of class teaching, before she cut the cord dedicating the news room. “He made the Ward family proud, even the people he met for the first time,” she remembered. “You touched so many lives Getahn, you touched so many lives, every where he met people. This day I think it is a blessing for God to make it possible for you to have passed through this womb and come into this world. It is so special to me cause there are so many women out there and you chose this womb to enter this world, so for respect to you as a mother for a blessing that I brought to this entire family, I cut this ribbon in the name of the father, the son, and the holy spirit,” Ward’s mother cried as she cut the entrance to the newly named newsroom. The news room opened for students’ continual use Monday morning when classes continued, and applications for the scholarship can begin this fall.